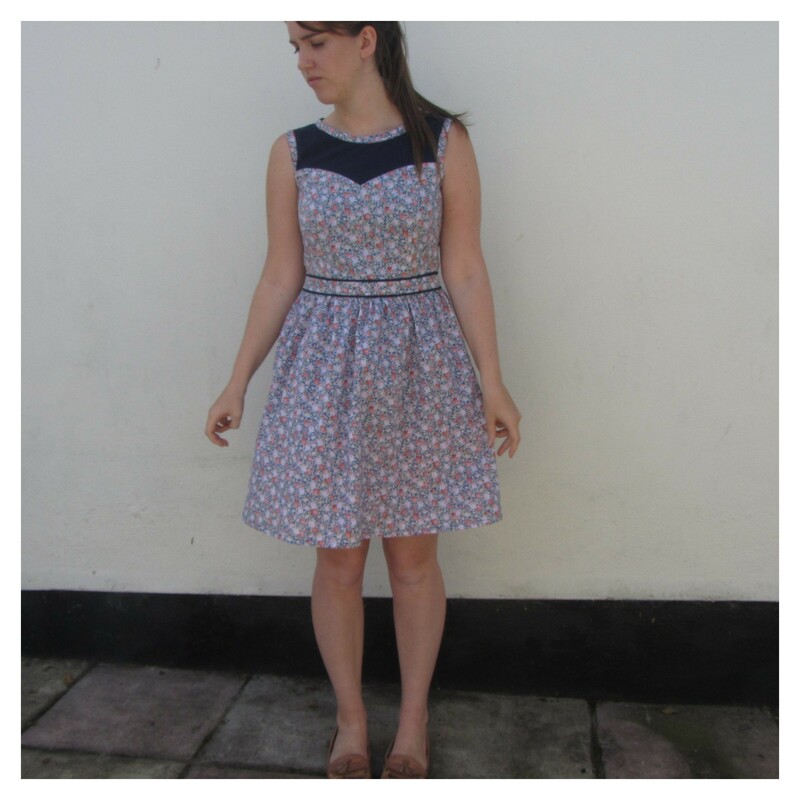 My last Ava is probably one of my most worn Me-Mades despite it’s issues because it’s looser fit makes it so comfy and it also seems less dressy than my various Simplicity 2444s. So I thought it was about time I took a break from S2444 and re-tried Ava. This is some cheapo (£2.18/m) floral polycotton and contrast navy polycotton (£3.06/m) from Trago Mills (just for a change!). 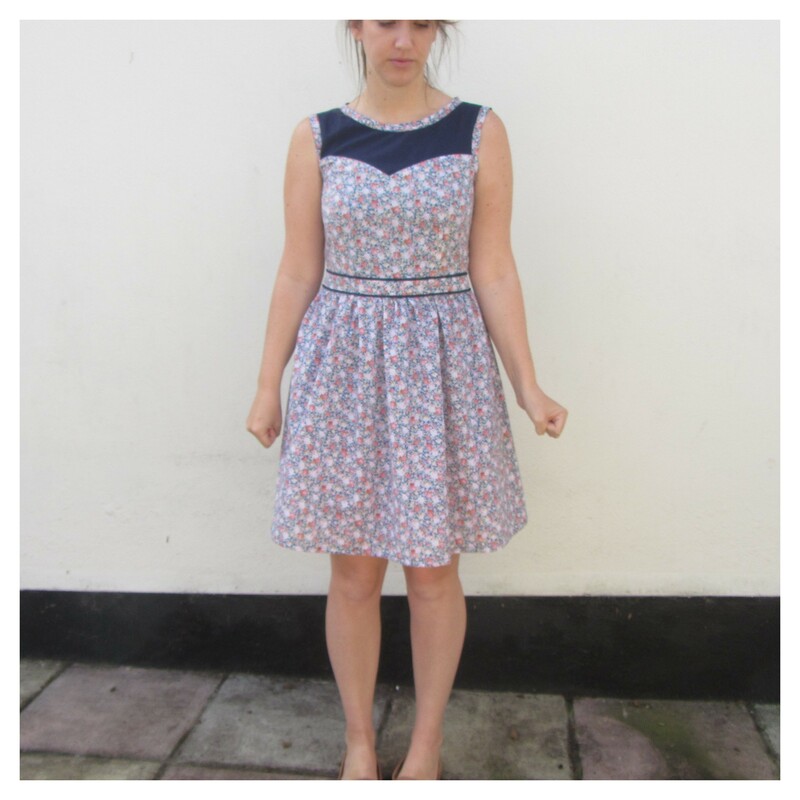 I still have over 1/2 a metre (of 2m purchased) of the floral and 1/2 of the 0.5m of the navy left, so the dress was £4.83, plus a £0.04 Malaysian zipper from my stash. However when I measured the pattern pieces and minused the seam allowances (5/8″ or 1.6cm), the finished garment size for the size 12 was 113cm at the chest and 86cm at the waist. What?? So I decided to go down two sizes and make the 8 this time. I also redrew the seam line between the back upper and lower bodice to be a straight line as I think the original curved line kind of emphasises the curve in my spine. 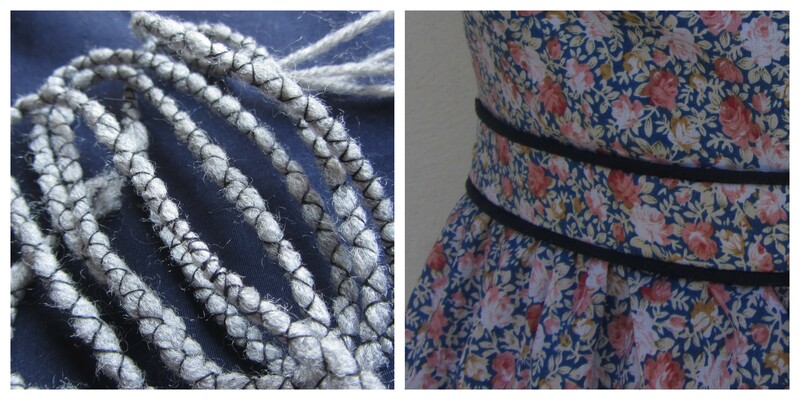 I also decided to try my hand at piping, but as it was all a bit of a whim I had to DIY some piping cord by twisting 4 strands of the yarn I’m using on my jumper (yes, it’s still in progress, 1/2 an arm and the hood to go) then using my widest zig-zag stitch to bind them together. I haven’t used piping before so I can’t comment on how it is in comparison, or how it will wash (cheapo acrylic yarn that’s meant to be machine washable at 40), but I like the effect. From a distance the piping matches up either side of the zipper, but up close the bottom line is out by a few mm’s, but not enough that I could be bothered to redo it. 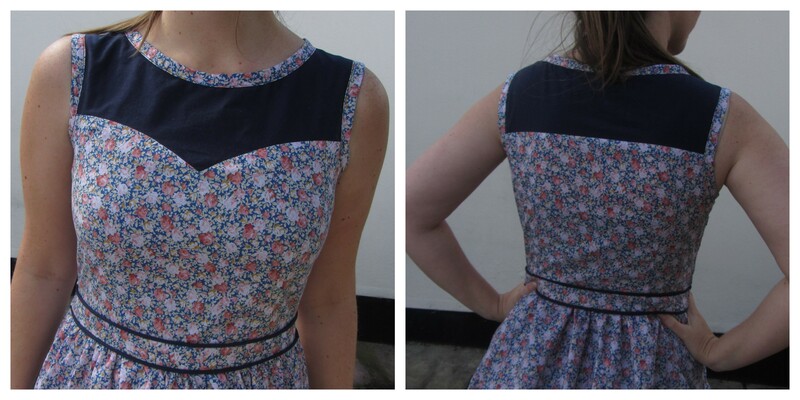 I had to re-sew the centre of the ‘v’ between the two front bodice sections because I stupidly thought I could get away with not stay stitching and just pinning loads. It made a nasty, wonky ‘v’, but once I stay-stitched the ‘v’ on both pieces, they came together well are are pretty even. 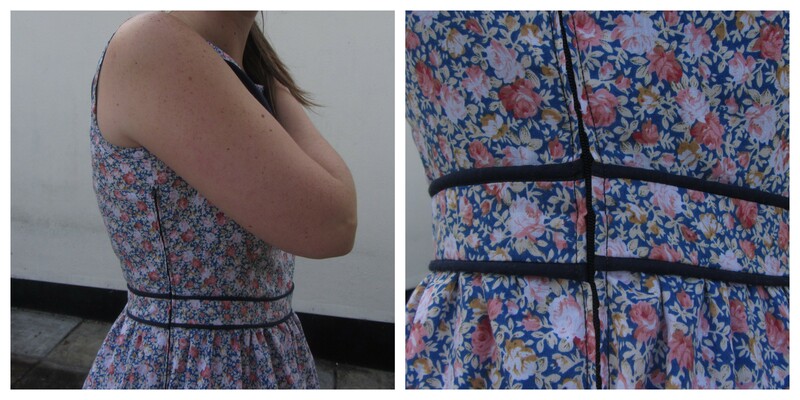 Instead of doubling over my bias binding the neck and arm holes, I used the bias binding as a sort of reverse facing. All the interior seams are serged because I was being too lazy to french them, and the hem is serged, double turned under and machine stitched. I made covers for the top and bottom of the zip to stop any scratching and look nicer! 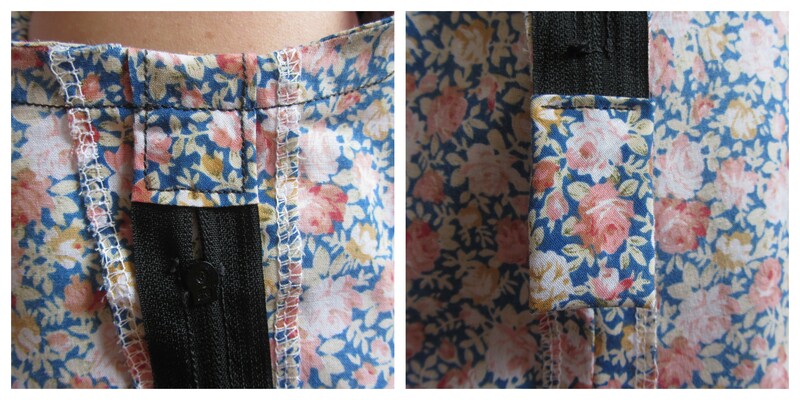 As you can see in the top zipper cover photo, I ended up having to increase the SA at the top of the bodice by 1.5cm, tapering into the original seam line about 5cm above the waist, as there was still a lot of gape especially if I raised my arms. And I couldn’t be bothered to trim and re-serge the edges obviously. 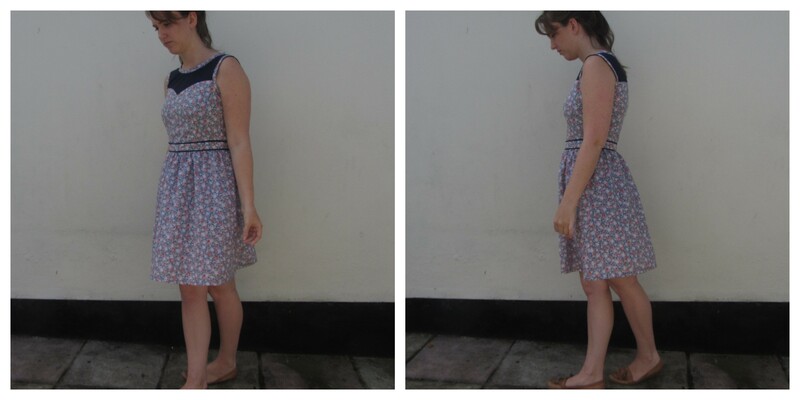 Altogether, despite how grumpy I look in the photos, I’m pretty happy with this version; it is a better fit, but then I can’t be fatty and eat too much, and I’m not 100% convinced about the fabric. I think something other than floral should be next…except I have one last piece of floral in my stash to use up.